The first semi-finalist for this season’s EuroCup Women are Beretta-Famila from Schio in Italy. They had already done the hard work in beating Gospic in the first match held in Croatia (68-63). With a 5-point advantage from the first leg Schio ended all suspense as they rushed out to a (16-2) lead with only five minutes on the clock. Sandra Mandir was the only player from Gospic with 24 points to trouble the hosts. Schio then went into the interval with a significant lead (44-18). After the interval Gospic offered more resistance but ended up losing the tie. For the home side Laura Macchi and Mudju Ngoyisa each had 16 points in the triumph while Beathny Donaphin and Raffaella Masciadri scored 12 and 11 respectively. Beretta won the match (85-54) and the series (153-117). Chantal Julien, one of the top officials in France, was one of the referees in this match. BC Moscow won the first leg (70-68) against Chevakata. This time they had to wait until the final period before putting away their guests (68-58) to advance to the semi-final with a 12-point aggregate win (138-126). BC Moscow had the better of the first half of the game and went into the interval leading (32-19). They appeared to be in control after four minutes of the third period still ahead (37-26). Chevakata then came storming back and hit the hosts 9-0 to come to within 2 points of BC Moscow (35-37). The hosts ended the onslaught and went into the final quarter still in front (42-37). Chevakata were to reduce their deficit at the start of the final period (40-42). Yet this was as close as they got to upsetting the hosts. Ekaterina Savelyeva had a game high 19 points and 6 rebounds to lead Moscow while Monique Curry scored 15 points, dished out 8 assists and took 7 rebounds. Galatasaray`s players Esra Sencebe and Petra Ujhelyi were just too hot to be handled by Ramat-Hasharon. The two players scored 35 points between them as Galatasaray, the hosts, won the second leg (70-53) to advance on aggregate (144-122) to the EuroCup Women semi-final. Sencebe was 5-of-7 from beyond the arc as she finished with a game high 20 points while Ujhelyi scored 15 points and took 13 rebounds. The visitors from Israel struggled early on to break the hosts’ defence allowing the hosts to go into the interval leading (37-30). Electra, the Israeli team, held on for three minutes in the third period (35-41) before collapsing totally. Galatasaray went into the final quarter with a comfortable advantage (59-38) and a 26-point aggregate lead. The visitors did not have an opportunity to spark a run of significant sequence in the final period allowing the home fans to savour the victory. 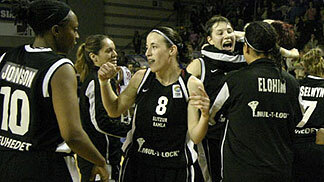 Daliborka Vilipic was the best player for Electra with 23 points. 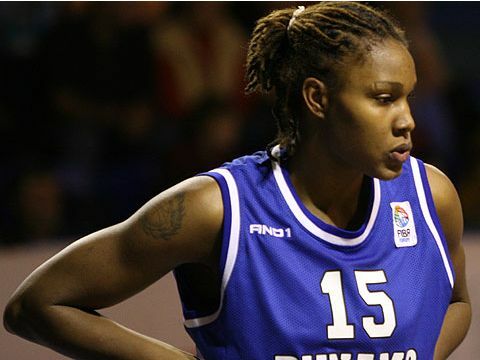 Rebekkah Brunson (in picture) poured in 32 points and took 14 rebounds for Taranto but it was not enough to see them qualify for the semi-final. Taranto had to make up a 28-point deficit from the first leg and appeared to be well on their way by half time (43-28). Elizur held firm in the third period not allowing the hosts to increase their advantage going into the final quarter (60-45). The final period was fast and furious. But the loss of Audrey Sauret-Gillespie for Taranto with five fouls effected the hosts. Despite the enormous effort of Brunson they were unable to make up the deficit despite wining the game (84-62). The first games are scheduled for March 6, with the return legs to be played on 12 March.